There was a time not so long ago when it looked like Baz Luhrmann's glossy and glitzy adaptation of F. Scott Fitzgerald's classic novel The Great Gatsby would be one of 2012's biggest holiday movies. That was until Warner Bros. switched the flashy feature out of its Christmas Day debut to the beginning of summer, May 10, 2013. While the motives for this move are unclear, it means fans of Luhrmann and Fitzgerald have been hungry for more of this movie that’s proving as elusive as the affections of its golden girl. While Warner Bros. has its hands full promoting The Hobbit: An Unexpected Journey, they haven't forgotten about The Great Gatsby. In fact, they've started revealing characters posters of the tale's troubled figures. 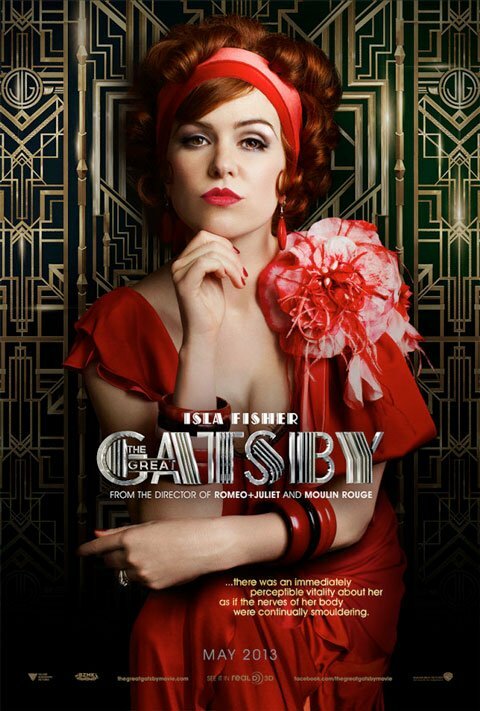 In what should prove the first of six, the two posters below show Joel Edgerton as the wealthy and dangerous Tom Buchanan, and Isla Fisher as the low-class gal with big dreams, Myrtle Wilson. These images are striking. The colors vivid, and the richly detailed costumes set off by the ominous gold gates from the film's poster. Tom looks handsome, but harsh, buttoned up and even shielding his gaze with dark glasses. And the way his manly hands cross seems like a threat, as the fall just below a quote from the novel that reads: "They were careless people Tom and Daisy—they smashed up things and creatures and then retreated back into their money and their vast carelessness…"
Daisy Buchanan, Tom's gorgeous but fickle wife, will be portrayed by Oscar-nominated English ingénue Carey Mulligan. I'm sure we'll be awed by her poster soon. But in the meantime, Warner Bros. offers a look at her foil, Myrtle. Where Daisy is graceful, Myrtle is crass. Where Daisy is elegant, Myrtle is bold. Here Myrtle is beautiful, but everything about her very red costume screams for attention, and suggests insecurity. The quote from the novel is telling, "…there was an immediately perceptible vitality about her as if the nerves of her body were continually smouldering." This is the impression she makes on the novel's narrator, Nick Carraway, who will be played by Tobey Maguire. 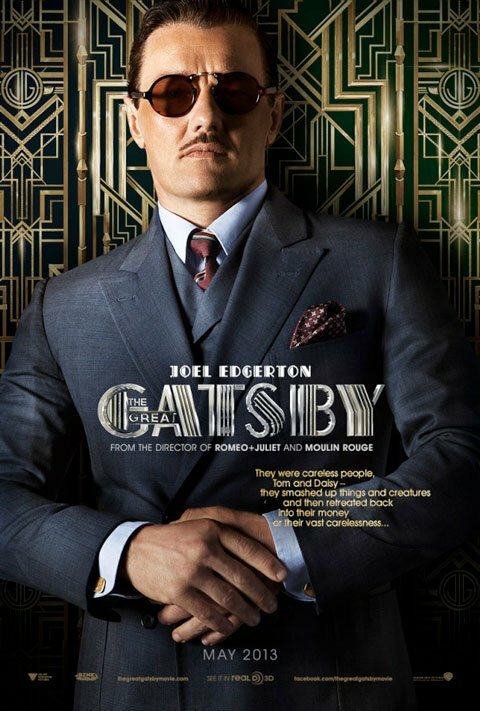 My guess, is the next two posters we'll see will feature Nick and his high-society girlfriend Jordan Baker (Elizabeth Debicki), followed by The Great Gatsby's most-anticipated poster reveal, that of Carey Mulligan as Daisy and Leonardo DiCaprio as her devoted lover Jay Gatsby. Expect them to be deeply glamorous.